Please note: The Times-Independent website is undergoing a massive transition. Links to their stories are currently not working, but will be restored once the website conversion is complete. Thanks! Investigation Continues into Loss of Mill Creek Beaver Dams Rose Egelhoff, Times-Independent, September 7, 2017. ​Mill Creek Beaver Dams Wiped Out. Rudy Herndon, Moab Sun News. August 17, 2017. Solutions, Rim Tours team up to provide shuttle to Potato Salad Hill during Easter weekend. Molly Marcello, Moab Times-Independent. 4/2/15. Go Green Challenge participant makes recycling, repurposing ongoing goals. 3/26/15. Week 2 of Go Green Challenge features inside look at Grand County recycle center, 3/19/15. Local resident takes on recycling, sustainable living with ‘Go Green Challenge’, 3/12/15. ‘Go Green Challenge’ aims to inspire more recycling, green practices, 2/19/15. New apartment complex helps Moab’s mentally ill, homeless. Molly Marcello, Moab Times-Independent. 1/29/15. Jeff Richards, Moab Times-Independent, 9/11/14. Moab Solutions celebrates 10 years of volunteer cleanup work. 5/29/14. Charging Hard: Taking Matters into Your Own Hands. Jeff Knoll's blog. 4/2/13. Off-roaders work to maintain recycling bins during Jeep Week. Read Jeff Knoll's excellent blog ("Charging Hard" link is above) about the incredible spirit of cooperation that the off-road community developed with Sara Melnicoff of Moab Solutions. Potato Salad Hill expected to draw thousands during Easter week. Steve Kadel, Moab Times-Independent. 3/21/13. Friends of the Library donates books to county jail. Steve Kadel, Moab Times-Independent. 3/14/13. Group seeks overnight shelter for homeless through winter. Steve Kadel, Moab Times-Independent. 11/29/12. Group hopes trail signs, bus ban will help preserve landscape in Mill Creek Canyon. Steve Kadel, Moab Times-Independent. 11/1/12. Second Lives: Sara Melnicoff. Charli Engelhorn, Moab Times-Independent. 7/12/12. Arizona man takes to the road to reduce litter. Charli Engelhorn, Moab Times-Independent, 7/5/12. This front-page photo of Ken Milliken led to a reunion with his estranged family. During his 15-year absence, he lost two siblings and gained a grandson. Portrait of homelessness: Bill Thompson. 12/29/11. Portrait of homelessness: Carey Jones. 12/15/11. Part Three: Creating Long-term Solutions. 12/29/11. Part Two: Lending a Helping Hand. 12/22/11. Part One: Understanding the Challenge. 12/15/11. Moab students have recycling 'down to a science'. Judy Fahys The Salt Lake Tribune. 5/21/11. Community group works to create solutions for homelessness in Moab. April Labine, Moab Times-Independent. 12/30/10. Local environmental groups plan ‘parade of horribles’ for Oct. 31. Moab Times-Independent. 10/28/10. Auto dealership donates vehicle to local recycling group. Michelle Wiley, Moab Times-Independent. 10/15/09. Moab Solutions cleans up Potato Salad Hill. Ron Georg, Moab Times-Independent. 4/16/09. Solutions receives grants and updates community on recent projects. Moab Times-Independent. 12/30/08. Volunteers needed for Hell’s Revenge clean-up. Moab Times-Independent. 11/13/08. Volunteers needed to help recycling cleanup for Moab Century Tour. Moab Times-Independent. 9/11/08. Barrels of Fun. Moab Times-Independent. 7/17/08. Local environmental group announces new projects. Moab Times-Independent. 5/15/08. Activist encourages city, county to hire conservation specialist. Jeannine Wait, Moab Times-Independent. 11/29/07. Susan Whitney, Deseret News. 7/2/07. The Solutions. Sara Melnicoff, Moab Happenings: Southeast Utah's Event Magazine. March 2006. 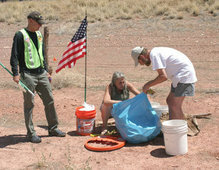 State Trust Lands thanks Moab volunteers for cleanup. LTE by John Knight. Moab Times-Independent. 12/3/04. Read more:Moab Times-Independent - State Trust Lands thanks Moab volunteers for cleanup"Solutions" group intends to find them for Mill Creek Parkway trash. Michelle Wiley, Moab Times-Independent. 8/25/04.